This walk: 2014-1-8. Lane End, Wheal Jewell Mine Leat / Reddaford Leat, John Taylor, Nattor Farm, Baggator, sluice, Nat Tor, footbridge, Tavy Cleave, Ger Tor, River Tavy, depth gauge, survey station, head weir. Link to Google Satellite view of the area incl a GPS track of the walk. Notice in the Lane End car park. Click the image to see a larger version. The Wheal Jewell Mine Leat / Reddaford Leat, up the slope from the car park. The leat contours around the hill (Kingsett Down?) to a tower (marked by the "V") at the modern Wheal Jewell Reservoir - I thought it was further left, hence the empty area of the photograph! Enlarged portion of the previous photograph. Along the leat - there will be several similar photographs! Looking back - the leat was engineered by JohnTaylor in the 1820s and powered 17 water wheels in 1875, one being 51 x 10 feet in size. Nattor Farm, first recorded in 1340. Occupied by the Reep family for 200 years: in the Napoleonic Wars (1803-1815), William Reep delivered milk to the Princetown prison daily by packhorse! Baggator, SX 548 806, elevation 372 metres (1220 feet). A sluice point. The engineering of the leat is such that from the head weir (328 m) to the footbridge (327 m) has a drop of just 1 metre. To the reservoir, three miles away, the drop was six metres. Seen again in this photograph. Looking up Tavy Cleave, with Nat Tor at left. Looking up Tavy Cleave, walking along the leat, with the River Tavy down on the right. River Tavy with Ger Tor above, SX 546 830, elevation 430 metres (1410 feet). Looking back the way we came from, with a meander in the river. A surveying station alongside the depth gauge. Another view ..... the leat is lined in this area. This looks like an old monitoring station over the leat - I believe I read somewhere there are only two of these in use on the moor? There used to be one at Beardown? A valve that operates how, precisely, on the head weir? Fairly low-level view up the River Tavy. Old bird's nest in the blockhouse. The rain came in a little before midday, more or less in line with the Met Office warning although it must have started earlier further west in Cornwall? 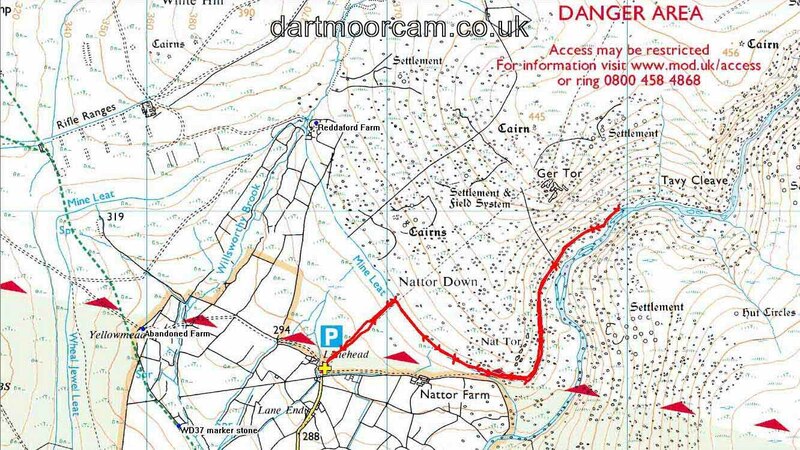 This walk was reached turning off the A386 by the Mary Tavy Inn and following signs to Horndon, Zoar, Willsworthy and Lane End, parking at the P symbol / yellow cross on the map, marked Lanehead on the map. Distance - 4.45 km / 2.77 miles.